The John Harms Center for the Arts in Englewood, NJ abruptly shut its doors on April 14 due to a mounting debt of over 2 million dollars, which the venue realized it could not overcome. The intimate 1,400- capacity venue opened in 1926 as a silent movie and vaudeville house and in recent years was a concert venue. "I'm very sorry to inform you that negotiations over the weekend failed to resolve our $2.3 million debt crisis, which originated and has been looming over this center since the 1990's," Robert Stern, the president and chief executive officer of the center's board, told the staff at a meeting. "Therefore, this morning we were left with no other choice but to close operations, terminate staff and cancel all scheduled performances effective immediately." Les Ballets Trockadero de Monte Carlo was to perform there this week. The saxophonist David Sanborn was scheduled to appear next month, and in June there was to be a production of "West Side Story." 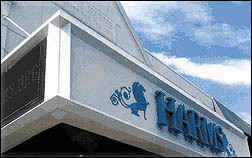 According to the New York Times, "like many other cultural centers, the John Harms suffered a decrease in ticket sales and donations after the terrorist attacks of Sept. 11, 2001. Last summer, ticket sales had decreased by $100,000 from the previous year, and corporate donations were down $150,000. Those decreases only added to problems the center already had in eliminating a huge debt acquired during a $6.6 million renovation of the theater that included a new roof, air-conditioning, a new sound system and marquee, and additional seating In 2001, a new fiber optic cable linked the theater to the nearby Bennett Recording Studios used to record performances by Tony Bennett and k. d. lang." Eastlake Stadium in Eastlake, Ohio, 20 miles east of Cleveland, is a new $21 million minor league baseball stadium with a capacity of 7,300. The home team is the Lake County Captains of the South Atlantic League having moved from Columbus, GA. Over 200,000 tickets have been sold for 70 home games with 400,000 fans expected for the home season. The two tiered designed stadium seats 7,300 spectators with 17 rows of 5,500 reserved seats, party decks, outfield lawn seating and picnic areas accommodating 1,300 fans and 500 spaces for field bleachers. The state of the art Eastlake stadium features the largest, interactive video scoreboard in minor league baseball and a 3,000 square foot souvenir store. Opening Day was April 10. Oneida Nation Homelands – Joel McKissick has been named entertainment manager at the Showroom at the Oneida Indian Nation’s Turning Stone Casino Resort. In addition to coordinating events with entertainers, he oversees the Showroom’s production, box office and usher staff. McKissick joined the Showroom when it opened in 1999 as a lighting technician, then was named production supervisor responsible for sound, lighting, stage hands and other behind-the-scenes duties. Before joining the Showroom, he was rental manager at Syracuse Scenery & Stage for 10 years. McKissick lives in Syracuse with his wife and two children.